Neal and I had a song and dance act that we rolled out at BV for a talent show. We did a Joe & Eddie tune. Can't recall if he was Joe or Eddy; certainly it was the one with more talent. I remember him as serious and driven. Clear-eyed, and destined to do things. I ran into Neal when I was working at Complete Post, back in the 90's. He was producing a spot and recognized me. We had good long talk. Sweet man. Was is Neal who brought down the house in his role as the Lord High Executioner in the "Mikado"? 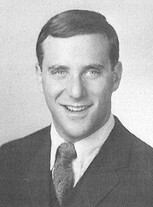 The Lord High Executioner was played by Chip Greene. Neal was truly a great guy. A big Democrat and loved LBJ. I still cherish the memories of our political discussions during those tumultuous times. I didn't really know Neal as a friend. But had wished that I did. He had talent, a sense of class and humor. Humble - without being deminuitive - while being out-going and friendly. I loved Brian's story about Neal and Jackie Gleason. The way Brian described Neal's demeanor and sense of humor with the twinkle of his bright blue eyes is the way I will always remember Neal. The words that come to mind are: kind, sensitive, intelligent and micheviously humerous. I still recall seeing Neal regularly with that same smiling face, good-naturedness, and his distinctive blue eyes! Even though we barely knew each other, Neal would always be happy, smiling and friendly when we would pass by one another. I loved the story about his meetings with Jackie Gleason. Two men full of positive energy and big smiles to brighten the day! I remeber Neal as really great guy and a loyal friend. He was very honest, kind and easy to talk to about any issues of our days. Ok here's my Neal Spiegel story. Long long ago, I was a very shy 8th grader. I was coming in from lunch to the next class, which was Mr. Shaver's history class. I was wearing a big heavy jacket over a flimsy blouse with button holes down the front that were a bit too large. I was early, and only Neal was in the classroom. I dramatically ripped off my jacket, and the entire stupid blouse went with it....Oops. Neal laughed so hard I thought he'd fall through the floor. The original wardrobe malfunction. And couldn't happen to a nicer guy.